What's a Lights-Out Warehouse and How is Automation Involved? 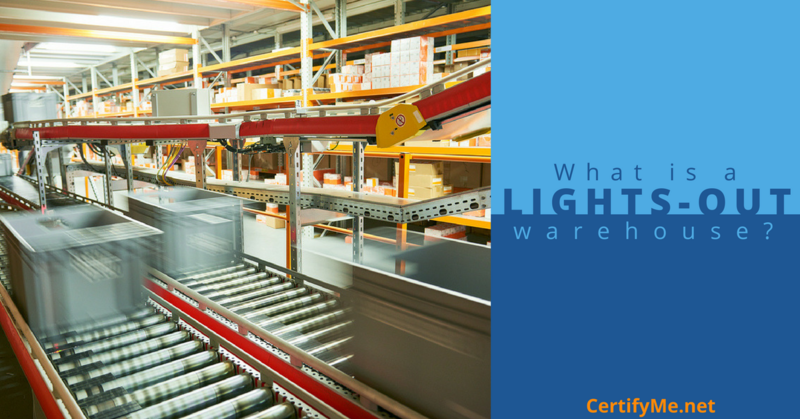 What’s a Lights-Out Warehouse and How is Automation Involved? The concept of a lights-out warehouse is not new, but recent innovations including the rise of automation have put this idea back on the map for many distribution centers worldwide. Online shopping increases the pressure on warehouses to deliver goods faster, cheaper and more efficiently. Many managers are looking for ways to cut costs and meet these demands. This article does a great job of shedding light on the lights-out movement and how employers and facilities can use this method to improve their workplace, reduce costs, better meet consumer demands, and achieve a good balance between human labor and automation. Read our summary of the article below and learn some great tips for how you can improve the everyday workings of your warehouse. What is a Lights-Out Warehouse? A lights-out warehouse is a warehouse or distribution center that runs on machines with no human workers present. Nowadays, lights-out is also a metaphorical term for the increased use of automation in the workplace since it cancels out some of or all of the presence of humans and human necessities. In the past, the lights-out concept was a strong driver for the use of automation. Now, things are flipped. Automation is the driving force behind lights-out facilities because it’s a much more appealing concept that doesn’t need much explaining as far as its efficiency goes. The challenge of figuring out how to reduce labor costs and low worker availability, while meeting increasing customer demands, are also strong motivators. What’s the Best Way to Use Lights-Out Today? Lights-out doesn’t have to be an all-or-nothing ordeal for warehouses and other facilities. According to the vice president of product at Seegrid, Jeff Christensen, it may not even be the best idea to go completely dark without any human workers. Setting a goal of 80% automation is a great step for companies, with a future goal of 95% automation. It’s just not necessary or financially worthwhile to reach for 100%. The lights-out method doesn’t have to be used everywhere to make a big difference, just in the most functional areas of the warehouse where improvement would be seen the most. What Kinds of Facilities Benefit the Most from Lights-Out? The types of workplaces that use the lights-out method the most are cold storage facilities and freezer warehouses, typically in the food and beverage and pharmaceuticals sectors. People cannot work in such harsh conditions like below zero temperatures. Replacing humans with automation eliminates the need for their presence. Where there are refrigerated sections in a warehouse, lights-out operations help to reduce the amount of traffic going in and out of these areas, reducing energy costs and any damage to goods that may result from increased humidity. In facilities that process many of the same sized items, lights-out is also a beneficial practice. Warehouses that process standard sizes of processed food or packs of canned or bottled soda, for example, can make use of automated work. What Are the Challenges of Lights-Out? The dark warehouse concept doesn’t come without its fair share of challenges. In conventional warehouses, mislabeled or damaged boxes are sent to a “hospital lane” where they are doctored up by workers. In a facility without people, it is much harder to make repairs to products. For the meantime, dark warehouses are usually set up in a corner of a facility, where they can do their work and still use human help when necessary. The other hurdle is cost. Employers need to balance the cost of automating their facilities with the value of their goods. Just because automation may seem to reduce labor costs and increase productivity, doesn’t mean it will make the most cost-efficient sense. Industries that handle high-value goods like pharmaceuticals, automotive parts, and electronics are likely to see a positive shift when increasing automation. But facilities involved in logistics where lower-value items are handled by workers may not see the best return on their investment. Industry professionals like Laura McConney, marketing specialist at JBT, says that the path to going lights-out is long-term, likely five to 10 years out for most facilities. How Can Employers Cut Costs and Meet Customers’ Demands? First of all, it’s important for employers and warehouse managers to determine if automation will work with their facility and the goods they handle. The lights-out method is best suited for facilities that handle many of the same-sized goods or a specific type of good on a daily basis. It isn’t the best for facilities that work with a wide array of items or retailers that serve a constantly changing type of client, like e-commerce fulfillment centers. These types of ever-changing facilities might be better off creating zones of automation to handle routine tasks. The biggest takeaway employers and warehouse managers can learn from the emerging lights-out movement is to use it where you can and where it makes the most sense. Creating a fully dark warehouse is maybe 30 or so years down the road, but creating pockets of automation in a facility and balancing human labor is an option right now. The conveyers, bins, and racks of automated storage and retrieval systems are naturally lights-out and work best in manufacturing and distribution facilities that handle a lot of goods coming in and out of storage. High-speed sorting equipment takes items to different parts in a warehouse and can operate independent of human control. They may only need people to help place objects in specific areas that are coming in, or are ending up in the damaged goods lane. Automation is still very much behind in the order picking process than humans.It simply can’t match human’s creative thinking and decision making. While automation technology continues to improve, employers must make sure that their order picking employees are well trained and certified. Doing so will improve productivity and reduce the number of accidents and mistakes that take place every day. The lights-out path is a long one, but as advancements continue to progress warehouse operators can look forward to more automation in the future and being able to use people in the most efficient ways possible. If you’re looking for one way to significantly improve your warehouse’s productivity and safety right now, then the best answer for you is operator training. Well trained and certified workers have the knowledge, preparation and skills to use equipment properly, recognize and avoid hazards, and prevent accidents that lead to reduced productivity and profit. Look into the OSHA-compliant online courses from CertifyMe.net today and start seeing results tomorrow!